Jameson Blake on leading lady Loisa Andalio: "At the moment, we're just friends. We're getting to know each other." 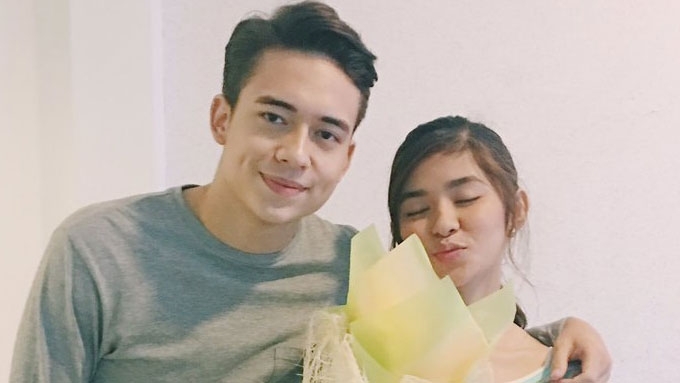 Jameson Blake sparked the interest of netizens when he gave a bouquet of flowers to his leading lady Loisa Andalio. Jameson clarified that nothing serious is going on, although he and Loisa often hang out with other friends after taping. “At the moment, we’re just friends. We’re getting to know each other,” he said. But what were the flowers for? Jameson said, “I didn’t do it to try to impress her. "Siguro just to [show that I] appreciate working with her. "I want her to be happy kasi she was feeling down at the time. I wanted to surprise her." Everything’s just platonic at this point, but their relationship is getting better. The photos that Loisa posted on her Twitter account last February 15 have already registered over 6,200 likes and 892 retweets. ON HASHTAGS’ NEW MEMBERS. Aside from hanging out with Loisa, a huge chunk of Jameson’s time is spent with his group Hashtags. He doesn’t feel threatened by the new guys. He considers his groupmates as “brothers,” with whom he bickers with occasionally. His relationship with his groupmates is considerably far better than his friend Karen Reyes’s relationship with her former group GirlTrends, which she left due to some problems. He recalls, “One time rumaket kami sa Mindoro. We talked. She had issues with them. "Pero mas gusto din niya taping na lang instead of dancing. May mga issues din sa kasama. WATCH: Karen Reyes on what she does not like about GirlTrends: "Mayayabang... may attitude."